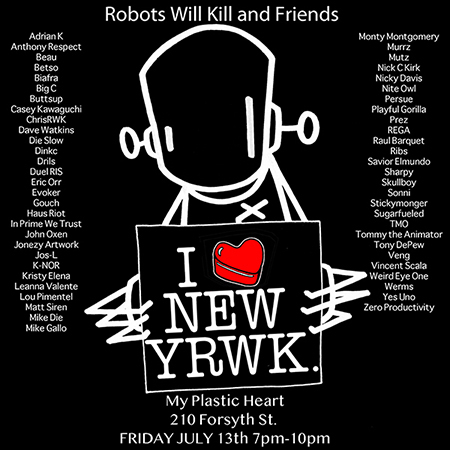 If you’re in the New York City area cruise on over to myplasticheart for the 3rd Annual Robots Will Kill and Friends get down. The exhibition opens tonight, Friday, July 13th from 7-10pm located at 210 Forsyth St. New York, NY. There will be 50 limited edition RWK tote bags filled with goodies (stickers, prints, enamel pins, artwork, etc) so get there early. 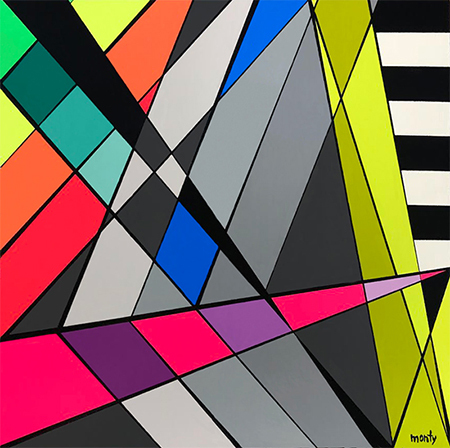 “Geo #85” 10” x 10” x 1.5” Montana Cans (official) on cradled birch panel with archival UV varnish will be featured in the show. Thanks to Chris Rwk Chillemi for the invite to exhibit with the talented artists of the RWK Family!